← This is All So Confusing… Who is God? I was amongst my own church friends and acquaintances that day. As I looked around the room and greeted those that walked in, I doubted. I doubted my ability to speak God’s message. I doubted that these prayerful, Christian women needed to hear what I had to say. I doubted that I could open their eyes to anything new and worthy. My confidence was slowly being zapped away by the enemy, and I knew it. I prayed for God’s presence. “Breathe in the Holy Spirit. Breathe out my selfishness.” I kept saying it over and over again. I stopped repeating over and over “I can’t” and I began saying “I can with God’s strength.” I needed him this day. For that matter, I need him everyday. The thing is, I knew my material. I had spoken on this same topic many times. I wrote the speech with an enormous amount of prayer. I had asked God to give me His words not mine. After all, my words were blah, but His words were incredible! It was my story, my faith walk and my unique view of God. 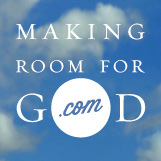 No one would be able to view God the way I do – I needed to share that view. If I didn’t share my view of this great God, then others would have a very limited, narrow view of God. John 1:10-12 tells us that God made the world and the world did not recognize him. He came to which was his own, but his own did not receive him. If I assume that every person who goes to church and every friend who seems to live a good Christian life doesn’t need to hear my view of God, then I am not doing my job. I am not doing God’s Will. I am not spreading His Word. Even the Jews had trouble seeing God the way Jesus could share God to them, but Jesus did it anyway. He shared. He healed. He loved. These women needed to hear my own story. What they did with it was not my business, but it was my job to share it. Because I was ready to conquer this doubt in my heart, God gave me the right to be his child. And who better knows a Father, than his child? What goes on between God and myself is just like what goes on in my household. There is an outward appearance (my “church” look) and an inward appearance (my home life). Those two must become one. In order for that to happen I must share them both. I must connect them together. I must relinquish my pride and let humility set in. I am His child. I know Him through my eyes. I know Him through my life experiences. I know Him in a way that no one else can ever see – unless I share it. You see, I received God. I took in His world and admitted that it was His creation. I allowed Him to take control of my life. I opened my heart to what He was giving me. THEN I took it one step further – I shared it with others. If I would have let doubt seep into my heart, then God’s message would never have been shared. No one ever would have seen God through my eyes. That is, no one ever would have seen my unique, special view of Him, my Father. Share your good and your bad. Allow God to work through you to talk with others about Him. Receive the gift that He has given ONLY YOU, and make yourself a child of God. This entry was posted in Faith, Family, God, Jesus, Religion, Social Justice, Uncategorized, Women and Christianity and tagged child, Faith, father, God, receiving God, sharing His Word, trust, unique view. Bookmark the permalink. Love the point you made about making the outward and inward appearances become one. Thanks for sharing!!! “Breathe in the Holy Spirit, breathe out my selfishness”. Amen! Just get caught up now…great reminder!! Anne Keep right on sharing – we love it! I was with you all the way up until your last statement, “make yourself a child of God.” If we believe in God and accept His gift of Jesus dying on the Christ, we are His children. PTL!